What is the significance of the images on the reverse side of Indian Currencies? There will hardly be a country in the world that does not have its own currency. Almost every country puts image of important person/monuments on its currency notes. India is also not behind in this practice. Indian currency note have images of Mahatma Gandhi, the Red Fort, the Sanchi Stupa, farmers, tiger and elephants etc. There will hardly be a country in the world that does not have its own currency. Almost every country puts image of important person/monuments on its currency notes. The basic purpose of showing the images of the different monuments, animals, sites, temples and person etc. is to show the country's culture and biodiversity to the world. This article is publishing the description of such notes which have these types of images. One Rupee note was first printed in India during World War I. Earlier, in the country silver coins of one rupee with a picture of George V was in circulation. But due to the world war I, the supply of silver coins get short hence the government printed the one rupee note on 30 November 1917. One rupee note is printed by the Ministry of Finance not by the RBI. 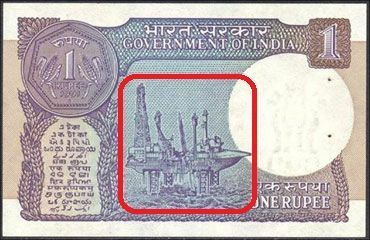 The front side of this note has picture of one rupee coin and reverse side of the note has image of an oil exploration site. Although the RBI has stopped printing of 2 rupee note due to higher cost of printing but the old notes still legal tender. 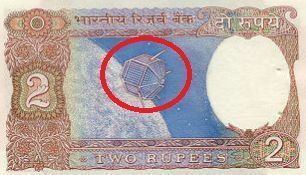 The front side of this note has image of ‘Ashoka Emblem’ while the reverse side of the note has image of India’s first satellite “Aryabhatta". This note shows India’s progress in the field of science and technology. Due to the increasing cost of printing of these notes, the RBI has stopped its printing but 85,000 million notes of this denomination are still legal in the market. The front part of this note has the picture of Mahatma Gandhi, while on the reverse part has picture of a farmer ploughing the field. This note shows the importance of agriculture in India's economy. Notes ranging from 1 rupees to 10 rupees go quickly from one hand to another, that is the reason they get rough quickly. To solve this problem the government decided to mint the coins of this value. The cost of printing of one 10 rupee note is around 96 paisa. The front side of old ten rupee note has Photographs of Mahatma Gandhi, Ashoka Emblem while the reverse side of the note has images of rhinoceros, elephants and tigers. The reverse side of the new series has images of Konark Sun Temple wheel and clean India logo. The cost of printing of 20 rupees note is equal to 10 rupees note. There are 5000 million notes of this denomination are in the circulation in the market. 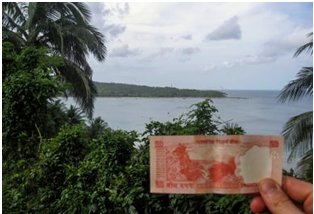 The front part of this note has Photo of Mahatma Gandhi (Water Mark), Ashoka Emblem, while the reverse side of the note has picture of palm trees which shows the view of "Mount Harriet Light House" in Port Blair. The cost of printing of a 50 rupees note is around Rs. 1.81 and 4000 million notes of this denomination are in the circulation currently. The front side of this note shows photograph of Mahatma Gandhi, Ashoka Emblem and design of the Indian Parliament, which represents India's strong democracy while the back side of the new note shows image of logo of ‘Swachchh Bharat’ and Chariot of Hampi (Karnataka). Hampi is a world heritage site in India. The cost of printing this note is 1.20 rupees and 16,000 million notes of this value are in circulation in the market. The front side of this note has image of Mahatma Gandhi, Ashoka Emblem while the back side of this note has image of "Mount Kanchenjunga", the highest mountain in India. Notes of this denomination have been printed for the first time in India. The cost of printing of a note of 200 rupees is around Rs 2.93. The front of this note has image of Mahatma Gandhi, Ashoka Emblem while the back side of the note has image of famous Sanchi Stupa. After the demonetisation in 2016; the old notes of 500 and 1000 rupees have been replaced by the new notes of Rs. 500 and 2000. The cost of printing of a new five hundred currency note is around Rs. 2.94. The back side of this note has image of “Swachchh Bharat" and the "Red Fort" of Delhi. This note has been printed for the first time in India. 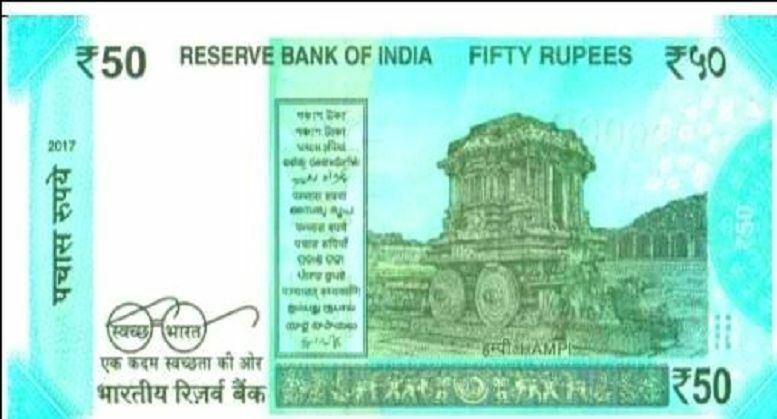 Due to advanced security features the cost of printing of this note is around Rs 3.54. The front side of this note has picture of Mahatma Gandhi while the back side of this note has image of Mangalyaan; launched by the Indian Space Research Organization on November 5, 2013. This note shows the scientific prosperity of India. Thus through all the notes given above, India has tried to prove the proverb of ‘unity in diversity’. It is clear from the images of these notes India want to show its biodiversity, cultural heritage to the world. Why “I Promise to pay the bearer sum of 100 Rupees” is written on the Indian Currency?